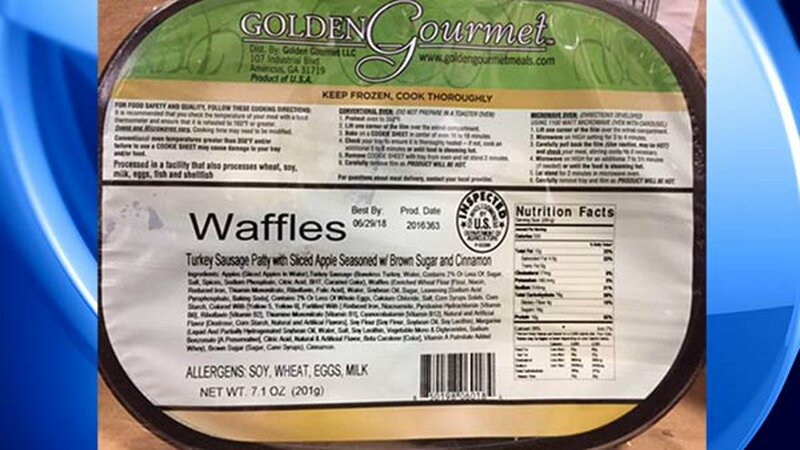 Golden Gourmet is recalling frozen waffles with turkey sausage due possible listeria contamination. The frozen waffles with turkey sausage patties were produced and packaged in December 2016. The recalled products are: "Waffles, Turkey Sausage Patty with Sliced Apple Seasoned with Brown Sugar and Cinnamon," lot codes 2016355, 2016363, 2016364 and 2016362. The affected products have use by dates of 6/21/18, 6/28/18, 6/29/18 and 6/30/18. They have the establishment number "P-51269" inside the USDA mark of inspection. The affected products were shipped to Georgia, Iowa, Illinois, Ohio, South Carolina and Tennessee. If you have purchased one of the recalled products, you should throw it away or return it to the place of purchase. Listeriosis, the infection cause by listeria bacteria, primarily affects older adults, people with weakened immune systems, pregnant women and newborns, and can be fatal. Symptoms of infection include fever, muscle aches, headache, stiff neck, confusion, loss of balance and convulsions, as well as diarrhea or other gastrointestinal symptoms. Listeriosis is treated with antibiotics.